There are two gondolas close to Meran, the Merano 2000 and the Seilbahn Hochmuth. 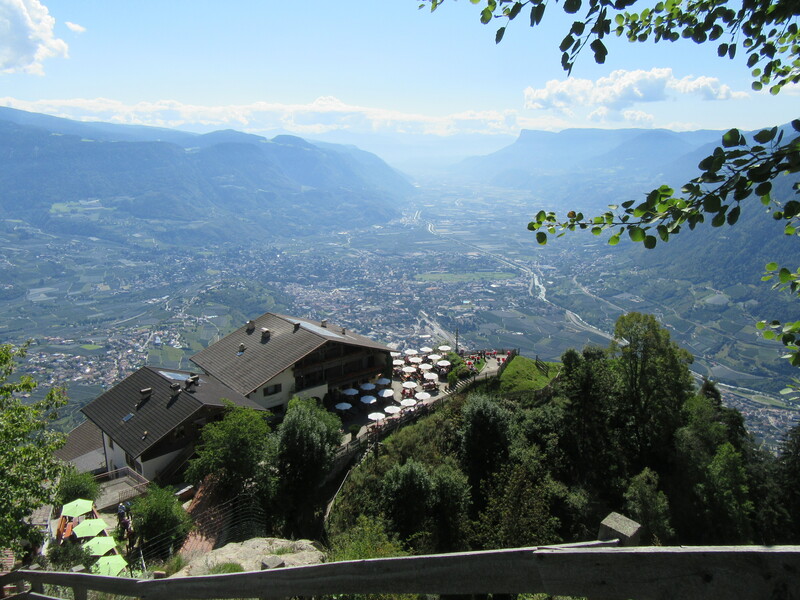 We decided upon the Seilbahn Hochmuth, as it would be the starting point for a downhill hike to the Pizzeria Picher. 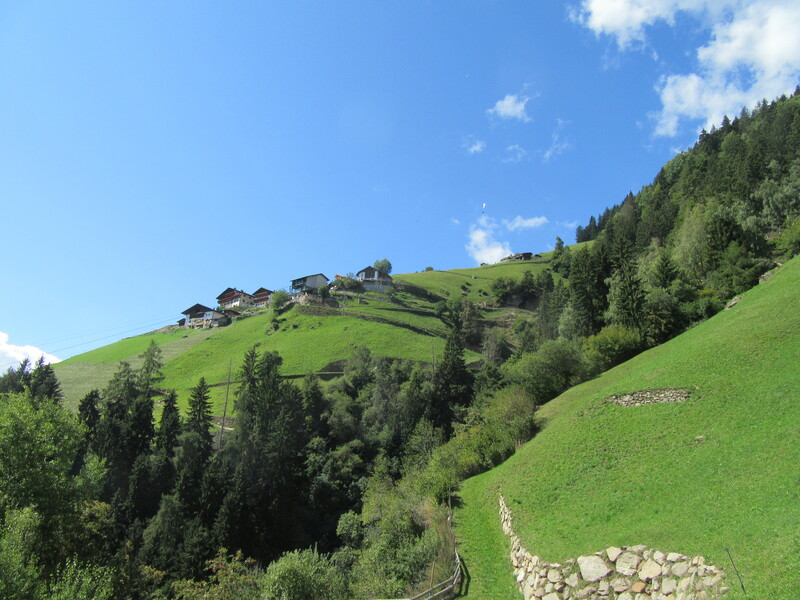 We took a bus to the Dorf Tirol (more on the Dorf later) and then walked up to the base station of the Seilbahn. The lineup at 10am in early September was pretty long but it was at least moving, giving us some hope that we’d eventually get to Hochmuth itself. The Seilbahn can run every half hour on slow days, but when it gets busy, it is running about every six minutes or so. It takes less than five minutes to get up to 1361m, leaving the base station far below at only 680m. It is a surprisingly pleasant trip, as the cabins are small enough that almost everyone has a view. You really only notice how fast you’re going in when you get closer to the mountain station. 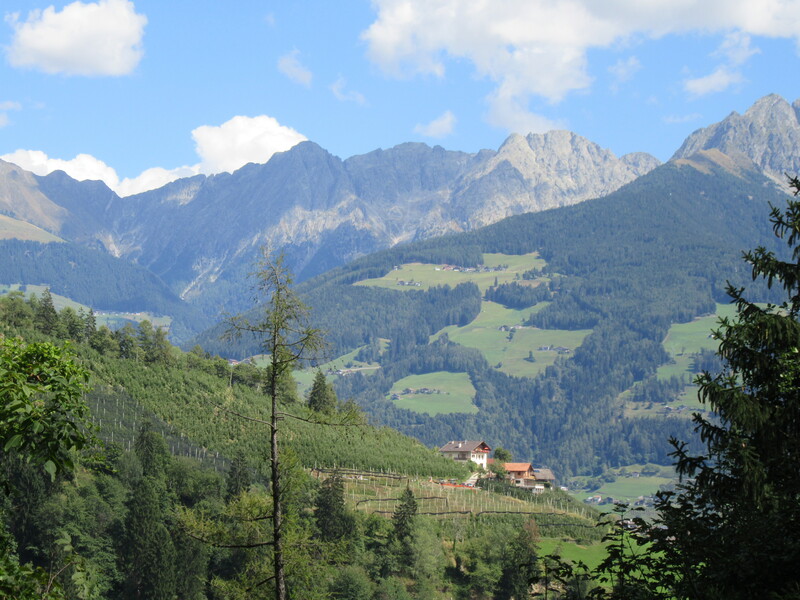 Looking back towards Meran with Schloss Tirol in the foreground, 2018. Take the fastest camera you have and just take photos for the entire five minutes. Looking towards Mals and Switzerland. Someone has to mow this lawn. I admit, I was somewhere between overwhelmed and in awe of the view. It feels like you are really high up, on the edge of a cliff and one wrong step is going to have you tumbling down a thousand meters. Südtirol has steep mountains. 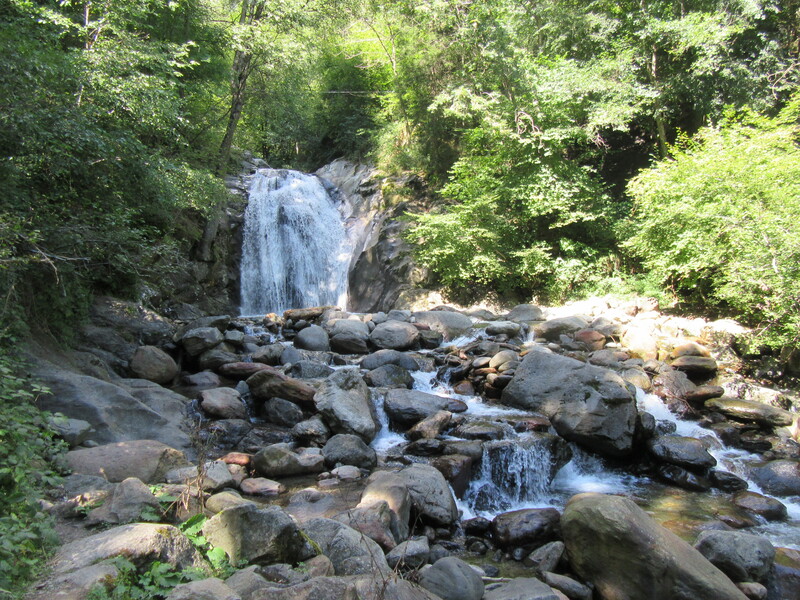 While there are a lot of hiking paths of all difficulty criss-crossing the area, some of them are definitely not for those who are afraid of heights. Like me. 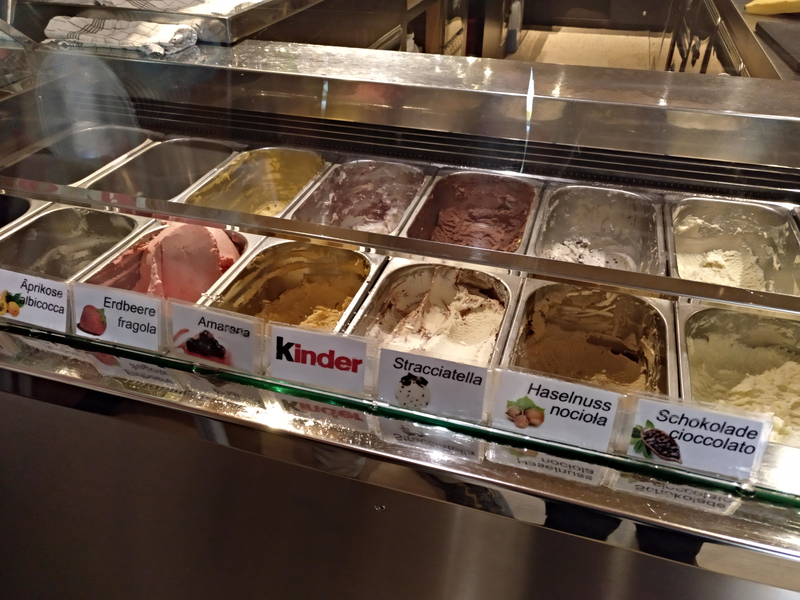 After some discussion, we decided upon the easy route down to Riffian – and the best ice cream you’ve ever had. We knew that was going to be our goal, just based on the reviews online, it was only a matter of which path. Turns out our easy path was pretty nice, winding its way down the side of the mountain, pass guest houses and farms and farms that are guest houses, making me imagine staying in one of these houses for weeks on end – writing and photographing the sky and going on walks. 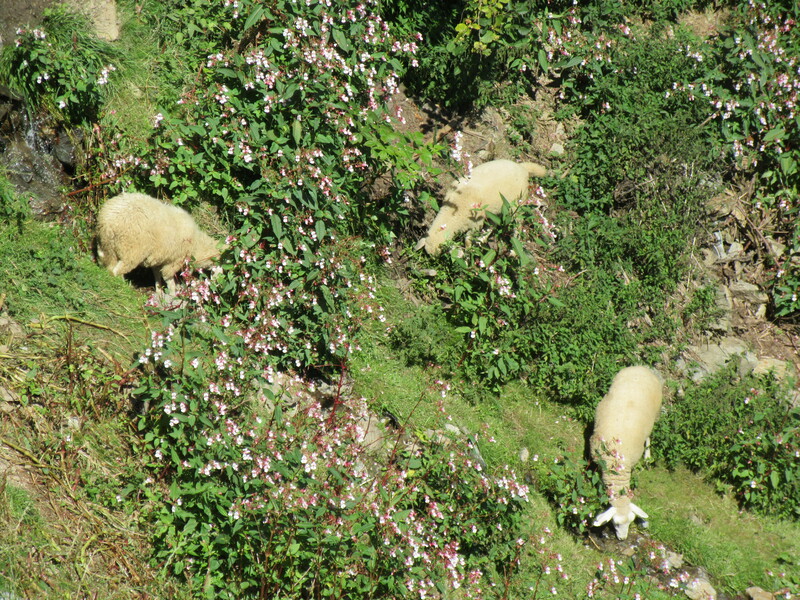 We met a few sheep, munching on grass clinging to the rock, they couldn’t even put their feet together, it was so steep. They seemed content. This pizza was worth waiting for. Fresh ham, locally sourced, along with freshly chopped pineapple on a nice soft base, that is purchased in an aluminum plate, so they only touch it to put it on the plate. It was wonderful. Yes, it is a Schär base that they use, but it is such a family enterprise and they take such care with the ingredients, it is just lovely. It honestly felt like the entire family was working there, including the small child gleefully running around the place. We were pretty happy. Just look at all that ham and pineapple. Then we decided that we deserved to try this ice cream that everyone has raved about. It did not disappoint. 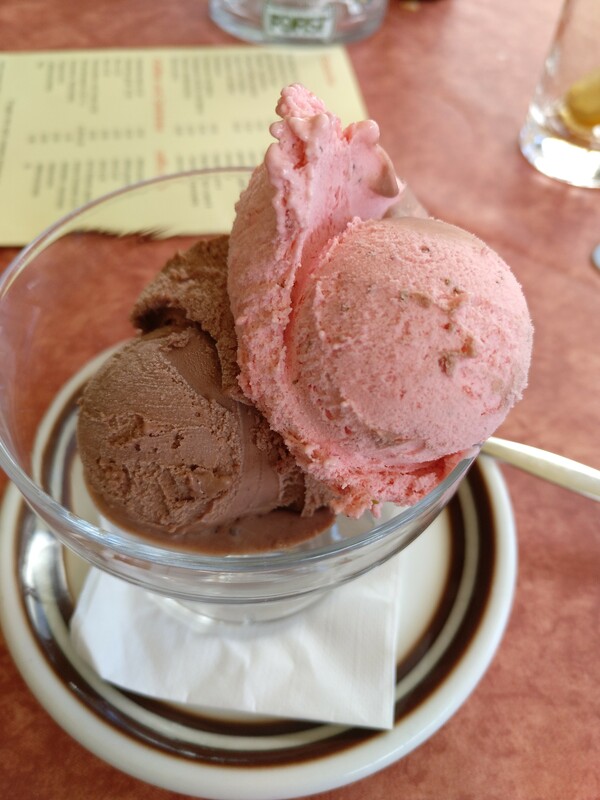 The strawberry ice cream tasted like strawberries and cream, it alone was wonderful, but the chocolate was just as delicious. The server knew exactly what flavors had gluten in them and which were safe. 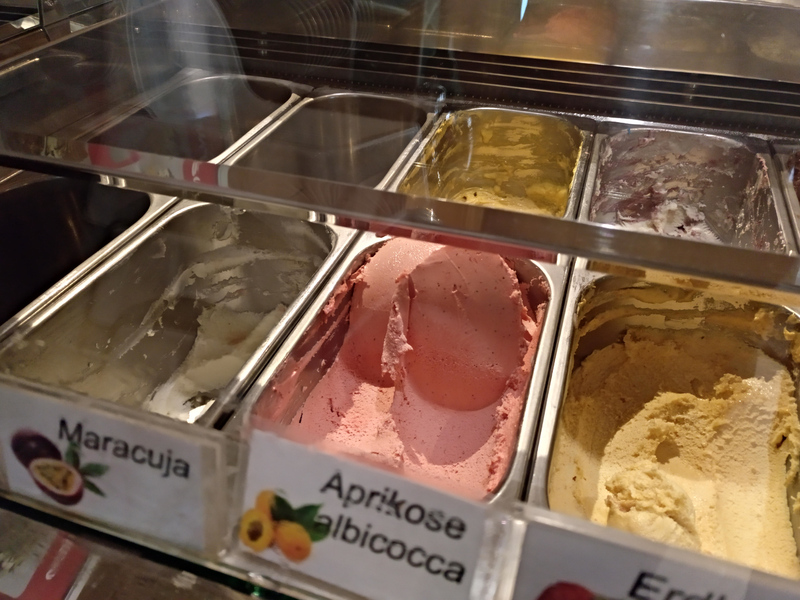 He had a large spatula and pushed back the upper layer of the strawberry, to get at the non-contaminated ice cream below. For the chocolate, he had another batch prepared in the back, untouched, so he opened that up for me. I can’t say enough good things about the Pizzeria Pircher. The service was excellent, the food was outstanding, the prices were more than reasonable. 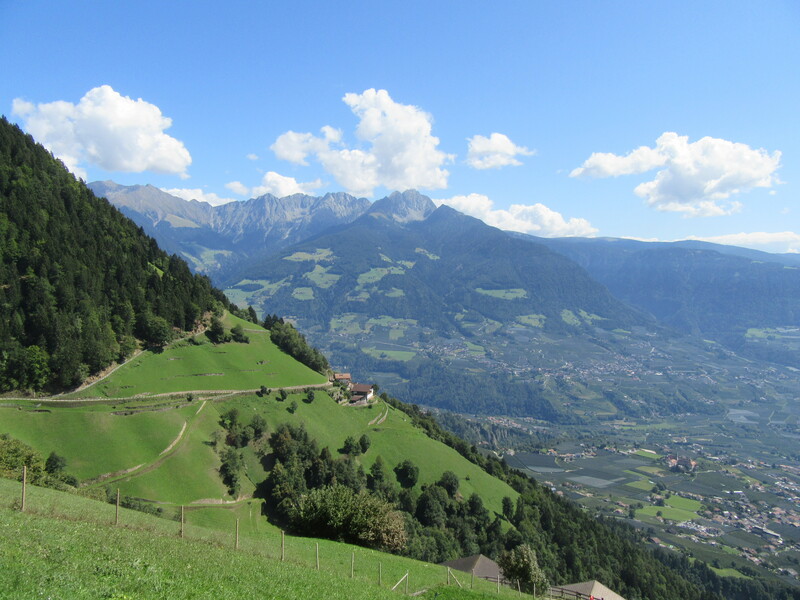 When planning my next gluten-free trip to Südtirol, I will definitely go to Pircher. Next up, Dorf Tirol and castles!